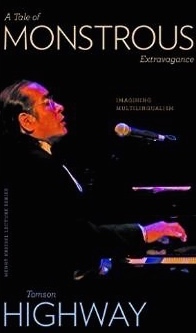 “I’ve always conceived of language as music,” says Tomson Highway: musician, playwright, novelist. “I play Chopin still, but in Cree,” he continues. Then, more than a decade later, it is as though he continues this conversation, in A Tale of Monstrous Extravagance. This slim volume is subtitled on “Imagining Multilingualism”, which might strike you as a poor prospect for entertainment, but Highway is a gifted presenter. With a live audience, this piece must have been wholly engaging. Even in only a handful of pages, flat stark black-and-white pages, his humour comes through, and readers have a clear sense of his cadence. But in between these observations and witty snippets, there is a great deal of personal reminiscence, philosophy and mythic writing. This volume begins with the tale of a birth, and even in the young life of Tomson Highway, it’s clear that there is a remarkable synergy at work. One can imagine the linguistics textbook. One can imagine the poems, the lyrics, the songs. One can imagine just how much more than is to imagine. Through all those windows. 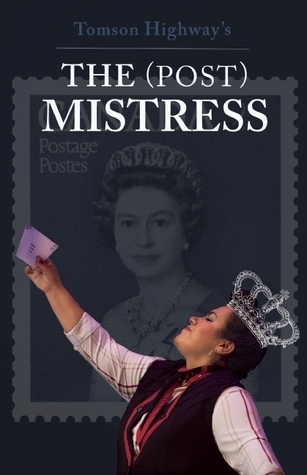 Something similar is at work in The (Post) Mistress, a one-woman show, which contains eleven musical numbers in a variety of musical styles, written by Tomson Highway in Cree, French and English. At the heart of the production is Marie-Louise Painchaud, a 49-year-old Francophone post-mistress in Northern Ontario. She is but a single window. Complexity, with its monstrous penny, evoking Sudbury with its monstrous nickel is a mining town, is in the background, however. The set is the post-office but overshadowing the props is Marie-Louise, whose voice, whose laughter, sets the stage more than anything. Yet the letters and the addressees create the sense of enlarging the cast and they provide the opportunity for Marie-Louise to reflect upon a variety of subjects. She affords access to many windows. The community is of vital importance and Mary-Louise evidently plays a central role in it, but in this context she appears to be on the margins, observing and considering the various scenarios which play out in the envelopes which come and go. There is another aspect of this story which fits with a conversation between Tomson Highway and Shelagh Rogers on CBC’s “The Next Chapter”, in which he discusses his relationship with his brother, who died some years ago. The conversation made me cry, but it was not simply that it was sad, but that it was so overwhelmingly beautiful. There was something so ludicrous and so true about his observatios, that I felt my understanding of the world shifting. I had not considered that words used to discuss loss and grief could contain so many possibilities. But language is fluid and illuminating when you look through Tomson Highway’s windows. These are wonder-tales for our world. I loved this review. My favourite part was how you tied in “Speaking one language, I submit, is like living in a house with one window only; all you see is that one perspective when, in point of fact, dozens, hundreds, of other perspectives exist and one must, at the very least, heed them, see them, hear them.” with your concluding comment – it was beautifully put. And I wholeheartedly agree. I’m bilingual, and live in a country where I am teaching one of my languages to kids who otherwise would have their entire world experience limited to their own, small peninsula. Yagan (indigenous language of Tierra del Fuego) – “The wordless, yet meaningful look shared by two people who both desire to initiate something but are both reluctant to start.” To restrict ourselves to a single codex for our understanding of the world is insane, and cruel. Thanks, Katherine. He writes beautifully and there are parts in this piece which are delivered in other languages, which is so interesting to see laid across the page, even if you can’t understand (any) all of it. I’ve got a book on my reference shelf which I love to dip into called They Have a Word for It that considers the kind of concepts that you describe; it’s wonder+full too.